When you have invented a product and want to quickly realize you make use of the reapid prototyping technique. It is the self-invented printed product or product part or machined or sculpted etc. Then, a silicone mold made. 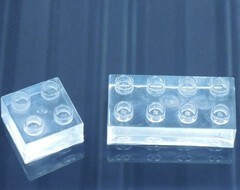 In the silicone mold can then molding a plastic such as poly urethane, epoxy or polyester. For the dimensional stability of the silicone mold and the resistance against the plastic materials is usually use use is made of an addition curing silicone. It is often the case that, the silicone should be transparent so that you can see the object or at least the contours of the object in the silicone mold. So you can cut open the mold on the iedeale way and the seam to come true as conveniently as possible.